More than 100 years before Perth got its first desalination plant, people in the goldfields were drinking desalinated water, albeit not from the ocean. Because of the decrease in rainfall, today Mundaring Weir, the storage reservoir for the goldfields has to be augmented by desalinated water from the ocean. While fresh water was almost impossible to find on the Eastern Goldfields, salt water was readily available from salt lakes and bores. Enterprising men soon set up ‘condensers’ to convert salt water to fresh. Some of the condensers were small and portable, operated by one man. Others were larger concerns. Battye Library. Men operating a condensing plant. 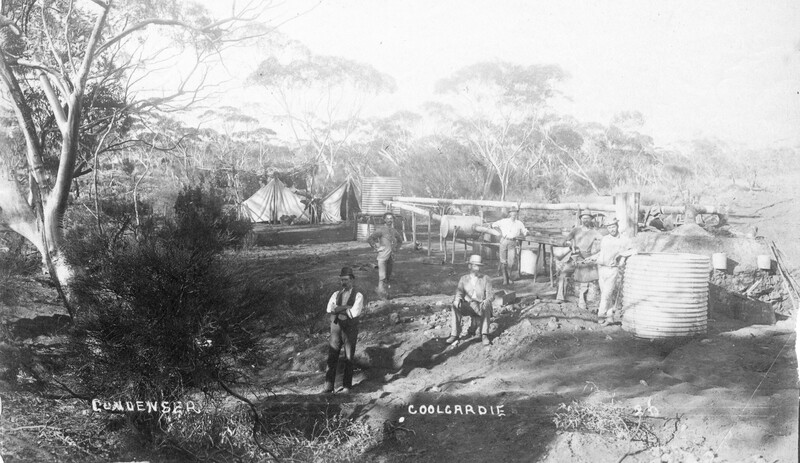 As the number of men on the goldfields increased, the government established huge condensers such as the one at Coolgardie capable of producing 455 000 litres of fresh water per day. In doing so it consumed 545 000 litres of salt water and 100 tonnes of wood.